What does all this talk about bit depth and RGB channels mean? What is an RGB channel? What is bit depth? Why would I set my Nikon to use 14-bit bit depth instead of 12-bit bit depth? Here is a short tutorial on bit depth and how it affects RGB color storage in an image. In figure 1 you can see the individual channel histograms for the red, green, and blue channels in the bottom three colored histograms. The white histogram on top reflects the luminance or perceived brightness distribution in the image and is a weighted combination of the three RGB channels. 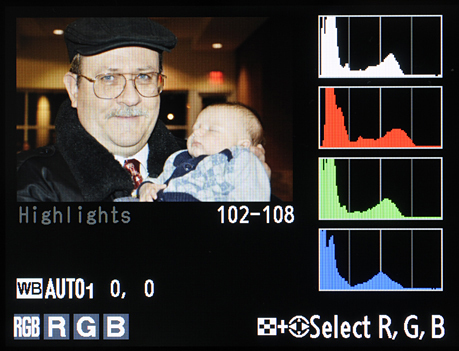 The three lower colored histograms show the exposure level for each RGB channel of an 8-bit JPEG file. Several current cameras give you the choice of shooting RAW in 12- or 14-bit mode. If you are shooting in 12-bit mode, your camera will record up to 4,096 colors for each RGB channel; therefore, there will be up to 4,096 different reds (R), 4,096 different greens (G), and 4,096 different blues (B). Plenty of color! In fact, almost 69 billion colors (4096 x 4096 x 4096). If you set your camera to 14-bit mode, the camera can store 16,384 different colors in each RGB channel. Wow! That’s quite a lot more color—almost 4.4 trillion shades (16384 x 16384 x 16384). Is that important? Well, it can be, since the more color information you have, the better the color in the image—if it has a lot of color. I always use the 14-bit mode. That allows for smoother color changes when a large range of color is in the image. I like that! Of course, when you save your image as an 8-bit JPEG or TIFF, most of those colors are compressed, or thrown away. Shooting a JPEG image in-camera (as opposed to a RAW image) means that the camera compresses the available image data so it will fit into an 8-bit file. An 8-bit JPEG image file can hold 256 different colors per RGB channel—more than 16 million colors. 16 million colors sounds like a lot of color potential and it is; however, compared to 69 billion colors (12-bits RAW) and 4.4 trillion shades (14-bit RAW) a mere 16 million shades (8-bit JPEG) is positively scrawny (256 x 256 x 256). There’s a big difference between the number of colors a camera captures in a RAW file and the number stored in a JPEG image file. That’s why I always shoot in RAW; later I can make full use of all those potential extra colors to create a different look for the same image. If you shoot in RAW and later save your image as a 16-bit TIFF file in your computer, you can store all the colors you originally captured. A 16-bit file can contain 65,536 different colors in each of the RGB channels. Many people save their files as 16-bit TIFFs when post-processing RAW files, especially if they are worried about the long-term viability of their camera’s proprietary RAW format. TIFF provides a known and safe industry-standard format that will fully contain all image color information from a RAW file. Unfortunately, the files are huge when saved in TIFF format. Many are looking into the Adobe DNG format as an alternate RAW format, hoping it will remain viable for the long term. Nikon’s intention is to support its NEF (RAW) format for the long term. Will that be the same for other camera companies. I hope so. If your camera manufacturer stands behind its proprietary RAW format and keeps on supporting it, you’ll be fine. If not, many after market software vendors should step up and support the older RAW formats. RAW seems stable. I can still open the RAW files from my 2002 Nikon D100 in Nikon View NX2 (version 2.5.x). If your camera offers both 12- and 14-bit RAW shooting modes, check to see if there are any speed penalties for shooting in the higher 14-bit mode. Since there is a lot more color information available in 14-bit mode, your images can have finer gradations of color. However, some cameras can slow down when used in 14-bit mode because they have to process a lot more color information. Test your camera in both modes before shooting a high-speed event like an air show or car race. Otherwise, the camera may slow down enough to cause you to miss some shots. To me, the speed loss is not important because I am a nature shooter and want the greater image quality 14-bit mode potentially provides. However, some are very sensitive to camera speed and will need to pay attention to this issue. There could also be some penalties in a reduced internal camera buffer size, with less room for burst shooting. Also, a 14-bit file will be even larger to store due to the extra color information. The Nikon D300S camera has some speed penalties for 14-bit bit depth. The frame rate drops from 6 to 2.5 frames per second when shooting in continuous-high release mode (CH). The newer Nikon D7000, D800, and D600 do not have the same slowdown so you can safely use 14-bit bit depth all the time. Read my article on the differences in JPEG, TIFF, and RAW formats. « Which Image Format is Best for My Photography?